On beginning of the holy month of Rajab and for celebrating the birthday of Imam Baqir , Imam Hadi (a.s) and martyrdom anniversary of Imam Ali-Al-Naqi (a.s) there was a three night ceremony in Imam Hussein (a.s) mosque. On the eve of birth day of Imam Mohammad Baqir (a.s) there was natal poem reciting followed by the speech oh Hojat-al-Islam Fayyaz. On the benedict of the fifth Imam’s birthday, there was drew to ____select the winner among the correct answers to the “Bahaneye Khelqat” competition participants which was held for Fatima Al- Zahra (a.s)’s birthday. The ceremony continued in second night and there were speech and natal poem reading. 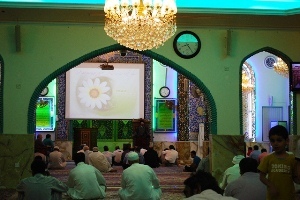 On third night as it was the eve of marthyrdom of Imam Ali – Naqi (a.s) there was mourning programs and speech. Need to note that attendants were gust of Imam Hussein(a.s)’s table for dinner after the ceremonies in all three nights.